Welcome to Hidden Dunes! 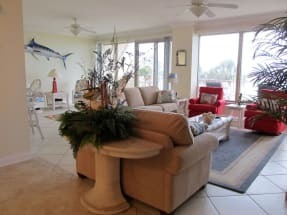 Emerald Coast by Owner is proud to be your premiere vacation rental service for this lovely condominium resort. Situated right on the coast of Panama City Beach, you can’t beat the location! Near all the fun in the area and the delicious food, but there’s plenty to do on Hidden Dunes property! There’s 91 units in the building, each with a private balcony overlooking the coast and access to the large pool, exercise room, kiddy pool, game room and a vending area! The condos here sleep 8-10 people, they consist of a large living area, a full kitchen, garbage disposal, dishwasher, a 44 foot balcony with a private hot tub, washer, dryer and overall 2,300 ft size in square feet! If you ever do decide you want to leave the resort, you’re still in for a treat! There’s so much to do in the area, a week won’t be long enough to try everything! A few awesome things you might want to check out is the Shipwreck Island Waterpark, the mini golf, fishing, diving, parasailing, Gulf World Marine Park and Ripley’s Believe It or Not! Museum. The fun never ends down here! When it comes to food, you’ve got nothing to worry about, there’s so many great places to eat down here you almost can’t go wrong, some of the best ones we think you’ll like are Angelo’s Steakpit, Captain Anderson’s and Bonefish Grill! You can’t go wrong with any of those so try one out, you won’t regret it! Emerald Coast by Owner is proud to offer hundreds of vacation properties including Hidden Dunes, located in Biltmore Beach. When you book with Emerald Coast by Owner, we make it easy for you to contact the property owners or managers directly and get answers to your questions before you book. ECBYO does not have booking fees! Book your next Hidden Dunes Panama CIty Beach vacation rental with Emerald Coast by Owner!